Professor Chinedum Peace Babalola FAS received this year’s May and Baker Nigerian PLC Prize for professional excellence in Nigeria. 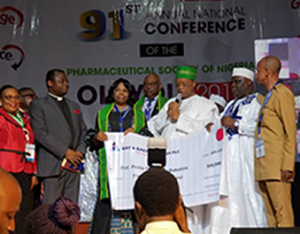 She received it on Tuesday 30th October at 91st Pharmaceutical Society of Nigeria (PSN) conference held at International Conference Centre University of Ibadan. 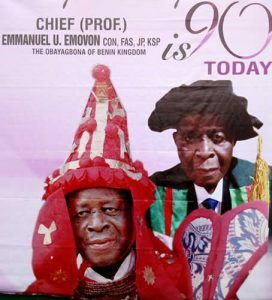 *Professor Akpanoluo Ikpong Ikpong Ette, FAS has passed on to glory at the age of 88. 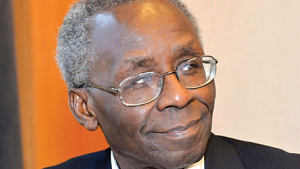 Professor Ette who was a Professor of Physics was a Foundation Fellow and Past President of the Nigerian Academy of Science. 1. Council Member (2014-2015) – Representative, Biological Sciences. 2. Council Member (2009-2010) – Representative, Biological Sciences. 3. NAS Sectional Committee on Biochemistry, Molecular Biology & Biotechnology (2017-2018). Professor Effiom Antia FAS was appointed to be a member of the African Science Plans Steering Committee (ASPSC). The ASPSC is composed of 12 leading and active African scientists from within and outside the continent. Professor Antia was appointed to join the ASPSC as one of the three Thematic Area Coordinators (TACs) with specific responsibility to provide leadership in the development and implementation of projects from the Africa Science Plan on Natural and Human-induced Hazards and Disasters in Africa. The ASPSC is under the auspices of the International Council for Science Regional Office for Africa in Pretoria, South Africa. The ASLM was established in 2011 as a Pan-African Professional Organisation charged with the responsibility of advocating the critical role and needs of laboratory medicine and networks across Africa. Professor Oluwatoyin Ogundipe, FAS was appointed the 12th substantive Vice-Chancellor of the University of Lagos. 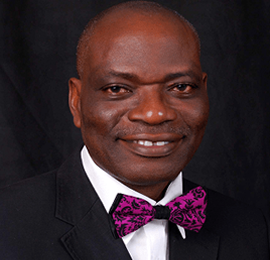 Professor Ogundipe, a Professor of Botany, who was inducted as Fellow of the Nigerian Academy of Science in May 2017 was the Deputy Vice-Chancellor (Academics and Research) of the university. Professor Chinedum Peace Babalola, FAS was appointed and inaugurated as the Vice Chancellor of Chrisland University, Abeokuta, Ogun State. Professor Babalola is a Professor of Pharmacy/Pharmacokinetics. 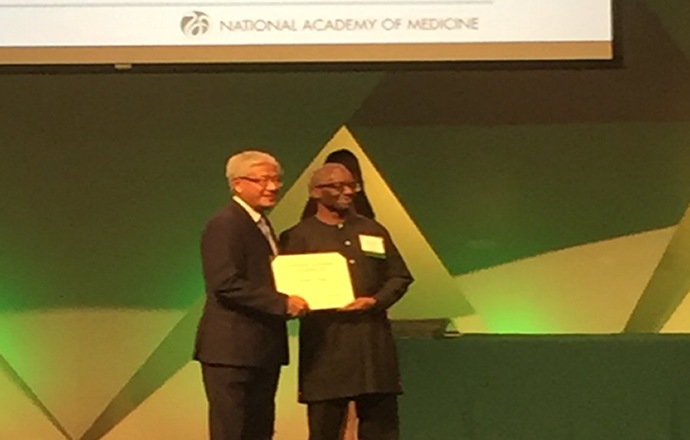 The immediate past president of the Nigerian Academy of Science, Professor Oyewale Tomori, FAS, has kept Nigeria’s flag flying with 80 other international members as he was inducted a member of the Class 2016, of the US National Academy of Medicine on the 14th of October, 2017 in Washington, USA.